Pass thru a cleft in the Arkansas River’s Big Horn Sheep Canyon and a high country Eden blooms with all that is good of Colorado. With a panoramic view of fifteen 14,000 foot peaks, Bear Creek Valley will truly take your breath away. 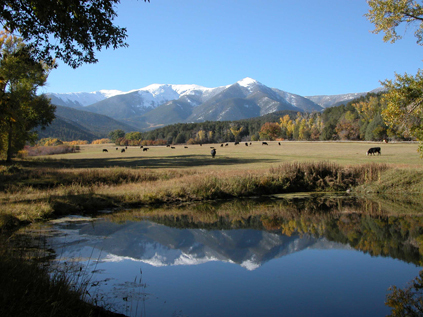 Nestled between the one million acre San Isabel National Forest and the spectacular Arkansas River, it seems impossible that this secluded, hidden wonder is only minutes from Salida’s great schools, hospital and shopping. Five minutes and a world away from downtown Salida, picture perfect Bear Creek Valley boasts hundreds of acres of lush meadowland surrounded by mountain vistas, with the cold, clear Bear Creek running the length of the valley and attracting an incredible variety and density of wildlife year round. With three sides bordered by BLM and the San Isabel National Forest, the ranch provides exceptional privacy to enjoy four seasons of spectacular scenery. Outside magazine named the “sweetly unpretentious town of Salida” as one of the “Dream Town and Adventure Hideouts.” How unique is Salida? Small town, but with the largest Historical District in Colorado, with big amenities, regional center with great schools and hospital, sitting at the base of the Continental Divide and fourteen thousand foot mountains with a whitewater river, the Arkansas, roaring thru town! Where cowboys, artisans, professionals, kids and families contribute their flavor to the charms of Salida.